The Crown Prince gave his impressions as “karate is so miraculous”. 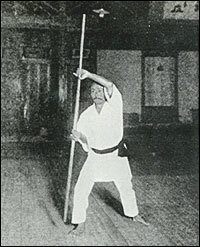 In May 1922, Gichin attended the First Budo and Physical Education Exhibition sponsored by the Ministry of Education at the request of School Section of Okinawa Prefectural government, and demonstrated Okinawa’s art of self defense “karate”. This was the first performance in the main islands of Japan. He did not return to Okinawa but stayed in Tokyo to spread karate-do under the name of “Karate Kenkyukai”, giving lessons in various universities and to the police. In 1924, he changed the name “ (Chinese hands)” to ” (empty hands) and “karate-jutsu (karate techniques)” to “karate-do (karate way)” based on the advice of Superntendent Priest E kun of Kamakura Enkakuji Temple. “empty” represents the spirit of Budo, which is self defense using no arms, and the ideology of the Wisdom Sutras. At this point, the Okinawan art of “karate-jutsu” was uplifted to encompass spiritual discipline. In 1936, Gichin changed the name “Dai-nihon Karate-do Kenkyukai”, which was established to promote communication and information exchange among people who study karate-do, to “Dai-nihon Karate-do Shoto-kai”. “Shoto” was the pen name of Gichin. 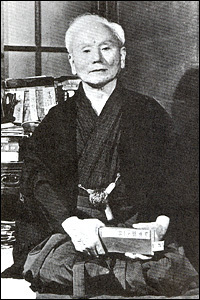 In 1939, Gichin constructed a karate dojo “Dai-nihon Karate-do Shoto-kan” in Zoshigaya, Mejiro, with the co-operation of Gigo Funakoshi and other followers. 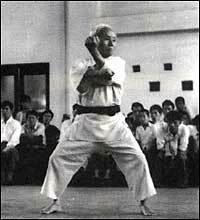 Gichin invented Taikyoku no kata, kumite ten-no kata, and kon no kata “matsukaze”.